Divergent is one of the few film adaptations that improves upon its source material. That's not to say that Divergent is a great film, but it's definitely a solid, often thrilling adaptation of a weakly written book. Due to the incredible acting from lead Shailene Woodley and strong supporting performances across the board, it manages to be more than a so-called Hunger Games knockoff. Some background for the uninitiated: in the world of Divergent, written by Northwestern alumna Veronica Roth, Chicago is one of the only remaining cities after a catastrophic war. In order to keep the peace among the denizens of the city, society is organized into five factions based upon values, each with different roles: Candor, the honest, are the judges and lawyers; Amity, the peaceful and kind, are farmers; Erudite, the intelligent, are scientists and researchers; Abnegation, the selfless, are public servants; and Dauntless, the brave, are police officers and soldiers who guard the fence around the city. Each child must choose which faction to join at age 16; after a simulated test, they receive their aptitude results, but ultimately the decision is up to them. Divergent's Chicago is a system that requires each citizen to know where they belong in the world. That fact proves to be a recurring problem for Tris, our protagonist. Born into Abnegation, she discovers during her aptitude test that she is Divergent, meaning, among other things, that she is qualified for multiple factions and that ordinary simulations do not work on her mind. In this dystopian society, being Divergent means she is a target for those who wish to eliminate her, and free-thinkers, from the system. Tris ultimately ends up choosing Dauntless, and is thrust into a world of chaos and violence as she must prove herself worthy of her new faction and learn to face her fears. The film is long, but it hurtles along quickly and effectively. 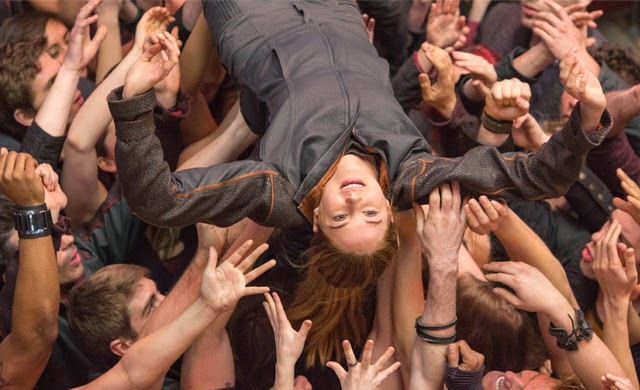 After Tris switches factions, the film follows the Dauntless initiation, replete with violent fight sequences and fear simulations and speeds towards Tris's romance with her love interest, Four, and the looming threat from Erudite, who are cast as the undisputed villains of the piece. When I saw the trailers and promotional materials for this film, I was concerned that the film would choose to split its attention between Tris and Four, turning a female-led film (in a landscape with so few to go around) into a tag-team effort. I am pleased to report that that is not the case; Four, as in the book, is a compelling and mysterious love interest, but is in no way an equal protagonist with our heroine. Divergent is Tris's story, in the film as in the novel, and rightly so. Shailene Woodley's Tris is the best aspect of this film, and I'm not saying that lightly. The original novel is narrated in often repetitive first-person narration, telling the reader exactly what Tris is thinking at all times. Yet Shailene Woodley manages to convey all of the thoughts running through Tris's head with a mere look in her large eyes, or a tightening of her lips. Her physicalization is a thousand times more effective and real than the endless soliloquies of the original text. What is refreshing about the film version of this story is how it manages to convey Tris’ evolution from timid Abnegation to hardened, brave Dauntless. 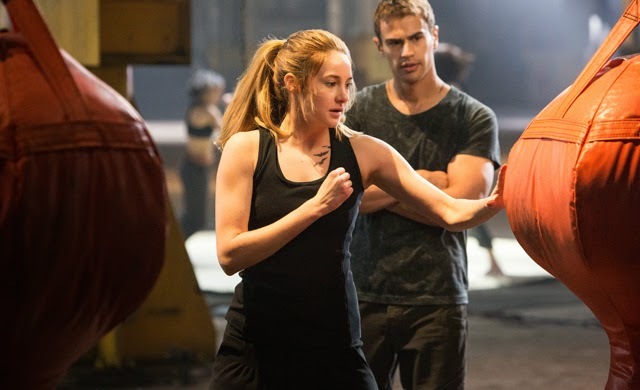 While physically weak, Tris has a running sarcastic streak that pops up just enough times to make you like her and root for her; again, this aspect is definitely more due to Woodley's performance than to the original character. The supporting roles are largely all well cast. Theo James, who plays Four, conveys both sternness and growing affection toward Tris over the course of the film. Since the novel must rely on Tris's inner narration, it doesn't quite convey the chemistry that Woodley and James have. Roth managed to write sexually charged scenes with all of the excitement of watching paint dry. Here, the inevitable make-out session didn't make me want to do the film equivalent of skipping pages until it was over. 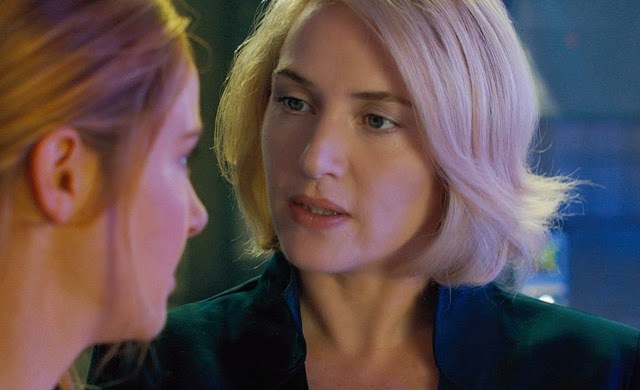 Additionally, Kate Winslet, who plays the villainous Erudite leader Jeanine, brings a cold cunning to her role. Yet, I would have liked for her desire for control and stability to have been less black-and-white; obviously, she has a reason for why she is the way she is. Evil itself is not enough of a motivation, and I wanted more nuance from this character. Ashley Judd has little screentime as Tris's mother, Natalie, but as the film goes on and Natalie's Dauntless-born origins are revealed, I had the startling realization: where else in film can we see a mother-daughter team teaming up to shoot and take down baddies? Although the violence of the film is jarring and brutal, I was satisfied seeing these female characters take on more typically masculine traits and demonstrate their strength. I was disappointed by the excision of several memorable book characters, the Dauntless-born initiates against whom Tris and the other transfers must compete. I understand the need to keep the amount of characters we as the audience must grapple with to a bare minimum, but I wish that Uriah, Marlene, and Lynn had made it into Divergent. The most jarring and unnecessary change from the novel is the introduction of an implied sexual assault. As someone who has read all three books in the trilogy, I believe this change was gratuitous, disturbing, and represented a misunderstanding of Tris’s character on the part of the screenwriters. Ultimately, though, Divergent the film is a vast improvement on the book. I can only hope that the subsequent films will continue this trend. While Divergent the novel has its weak points, it is the strongest of the trilogy. I hope that Woodley, James, and the writing team will approach the next film with the same dedication and perhaps a bit more dauntlessness. Divergent is rated PG-13. Trigger warning for implied sexual assault.